Chevrolet India has launched its Trailblazer SUV here at Rs 26.40 lakh (ex-Delhi). It will be sold here as a CBU and will be available in just one trim - the top-spec LTZ variant. Although the international model gets two engine options, the Indian Trailblazer gets just the top-spec 200PS 2.8-litre turbo diesel mill mated to a 6-speed automatic. Another feature that the India-spec Chevrolet Trailblazer misses out on is four-wheel drive. The Trailblazer uses a ladder frame chassis with a wheelbase of 2,845mm and a ground clearance of 231mm. This seven-seater comes with flat-folding rear seats, a Bluetooth-enabled touchscreen infotainment system, multifunction steering wheel, leather seats with electric adjustment for the driver and automatic climate control. At this price, the Trailblazer will take on competition from the likes of the Toyota Fortuner, Honda CR-V, Mitsubishi Pajero Sport and the Hyundai Santa Fe. Online bookings for the Trailblazer are on from October 21-25, at a booking amount of Rs 25,000 at amazon.in. Largest SUV in its class, with best-in-class ground clearance Most powerful SUV in its segment, with 500 Nm of torque and 200 PS Safety features include hill start assist (HSA), hill descent control (HDC) and traction control system (TCS) Priced at Rs. 26,40,000 lakhs (ex-showroom, New Delhi) for 2WD AT variant Bookings open today on Amazon.in at Rs. 25,000 MUMBAI  General Motors India today launched the Chevrolet Trailblazer SUV. The newest addition to its lineup is priced at Rs. 26, 40,000 lakhs (ex-showroom, New Delhi) for the two-wheel-drive, top-end LTZ version with an automatic transmission. 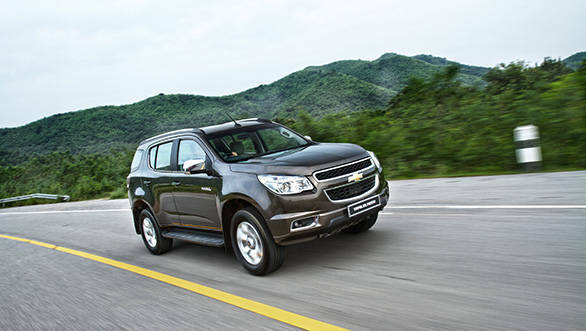 The Chevrolet Trailblazer is equipped with a 200 PS engine that produces 500 Nm of torque. Combined with its best-in-class dimensions and ground clearance of 253 mm, it makes the Trailblazer the largest and most powerful premium SUV available in India. "The Trailblazer is Chevrolet's toughest yet most refined SUV, offering premium ride and handling dynamics," said GM India President and Managing Director Arvind Saxena. "It has a commanding road presence and a host of first-in-class features along with the latest technology and design." GM India Vice President of Marketing and Customer Experience Jack Uppal added, "The Trailblazer will enable our customers to own a true global SUV. True to its name, the Trailblazer with lay the path for nine new Chevrolet vehicles being launched in India over the next five years." 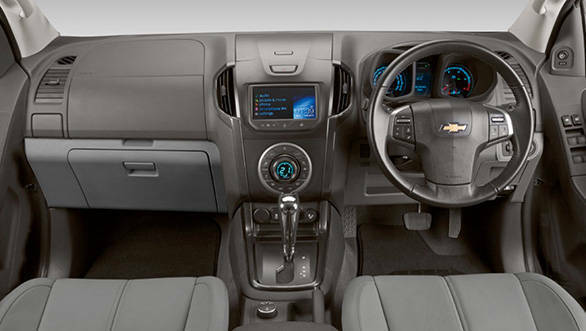 The Trailblazer offers a host of unique features, including first-in-segment projector headlamps, ceiling-mounted rear air-conditioning controls with four vents for the second- and third-row seats, a six-speed automatic transmission, a 7-inch touchscreen, the Chevrolet MyLink infotainment system and Siri Eyes Free for Apple users. Safety features in the Trailblazer include dual air bags, electronic stability control (ESC), anti-lock brakes (ABS) with electronic brake-force distribution (EBD), cornering brake control (CBC), hill start assist (HSA), hill descent control (HDC), traction control system (TCS), panic brake assist (PBA) and hydraulic brake assist (HBA). The 2016 Chevrolet Trailblazer, imported from Thailand, will be available for bookings on Amazon.in only from October 21-25, at a reservation deposit of Rs. 25,000. Customers will receive their SUVs from their local Chevrolet dealership. Bookings can also be made through Chevrolet dealerships.